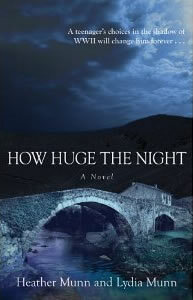 How Huge the Night is a debut novel by mother-daughter writing team Heather and Lydia Munn. Set during World War II, this novel is based on the true story of Le Chambon, a small village in the country of central France. This book tells the story of fifteen-year-old Julien whose family has relocated to southern France, hoping to outrun Hitler and his army. The problem is that Julien doesn't want to run, he doesn't want to wait around listening to the radio for news every night. Soon after his family opens their door to a Jewish boy, Julien meets Nina. Nina and her brother are Austrian, and are fleeing based on their father's dying command to them. Soon someone's life and death depends on Julien. When surrounded by a conflict too big for them to understand each of them struggle with what to do. And what if it's not enough. I had a hard time "getting into" the book. The beginning was rough for me and I had to work through it to read the book. The pace and writing style are different from what I've been reading lately which I think made this one harder for me. I think given some time this is a book I will try again. With that said, it wasn't a bad book. The story overall was great, and is one that needs to be told. There were interesting characters, set in an incredibly important time period in history. I have several students who, as I read, I immediately thought would like to read this book. The end of the novel has a historical note, detailing areas of the novel that were fact, and those that were changed for the story. As a history and reading teacher I greatly appreciated that this was included at the end of the story. I was provided with a complimentary copy of this book by Litfuse as a part of their blogger review program. I was not asked for a positive review of the novel, all opinions expressed are solely my own.